Hey, You Can’t Grab That Stick! It’s a Machete! The fact that this question continuously pops up, is reason alone to write about it. A Filipino stylist should know about this sword/stick thing and be able to explain and articulate on the subject. A stick is a sword? A sword is a stick? Not really. Can’t grab? Shouldn’t grab? As a person doing Arnis/Kali/Escrima since 1986 as an obsession at first, and now as a curious hobby of sorts, let me sketch this out for you. There are MANY Filipino systems, way more than you have heard of. We just know the lucky-break ones. And systems are being invented all the time. 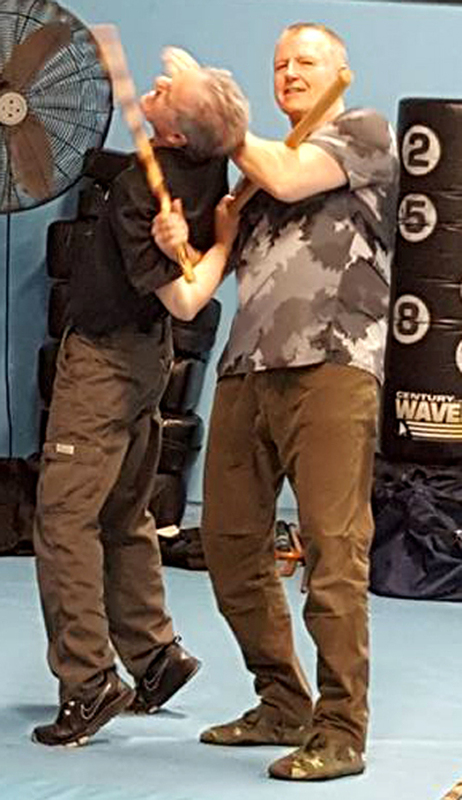 In most of these old and new systems, practitioners have replaced the “wooden” (rattan) stick for the machete, sword as a safer training device. This replacement causes the confusion. I guess for some I should introduce or remind folks the difference between a round stick and a flat sword/machete. You see, one is round. One is flat. There ya go! But really, they swing different, weigh different and if you are limited to flat edges, one should really be applied differently. A stick is an impact weapon that strikes with the tip, the staff of it, and the handle. On the subject of the stick and sword handle – the sword handle can be round so to speak, but often very contoured and form-fighting for the hand. 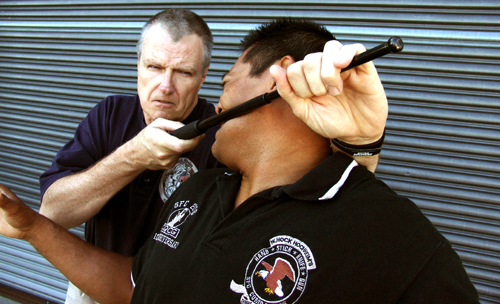 While the Filipino stick is usually just round with no designated end for an official handle. In fact it might be a little taboo to have a designated handle on your FMA stick? We sometimes grimace a bit when we see an over-taped or customized baston handle, don’t we? While FMA swords have all kinds of admirable, customized grips. And proud of it, too. Many of the machetes around the world are single edge, and the swords are not necessarily single edged, and can come in all kinds of interesting and elegant shapes, but FMA swords usually that not big and wide like…like say, European broadswords. (Please do not send me photos of giant, Filipino broadswords – I know they exist – I used the word “usually.”) But with the “roundness” of a stick, you lose the very vital, flat-edge-ness of the sword. Oh yeah, and swords are more deadly, faster finishers and need less power application than sticks. 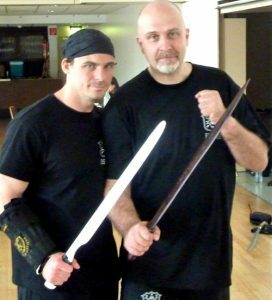 To accept the stick hand grab is too ignore sword tradition and perhaps believe that in our next street fight, we would be stick-dueling with some thug? The designated thug will use the exact same-sized, designated stick we have! Then again, will you be sword or machete dueling? Outside of a few big “civilized” countries? Well…yes. Somehow the sword shape-shifted into the stick so deep in our hearts and minds. Oh, for the love of sticks! For decades, the FMA lover just used sticks, stick, STICKS! 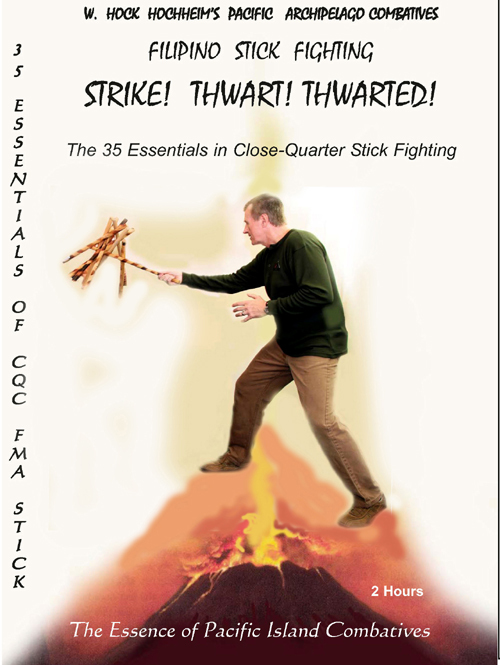 The art, the tricks of STICK fighting, stickk-centricm alone developed. Many lovers do not know, or do not care that the sticks are supposed to be swords and machetes. And with the stick, comes a lot of double-hand grabbing and opponent stick grabbing. Look at Tapi-Tapi and Balintawak, for just two pop examples. We all accept the rules that sticks are sticks, sticks have become embraced in FMA and by God, we’ll grab them whenever and where ever we want. So, in the 1990s stick enthusiasts came out of the traditional closest and started declaring “you must remember this, a stick is just a stick, a sigh is just a sigh. The fundamental things of living, as time goes by.” And I agree! Just understand you are using a stick. The round stick acceptance was easier for me perhaps because, being a cop, I always thought of the rattan baston as a police stick (or an axe handle). My interest in the FMA stick was not an esoteric, artsy pursuit. People are not “Kung Fu fightin’ – fast as lightning” with matching 28-inch sticks in the alleyways of London (I hear they are throwing a lot of acid these days) or on the south side of Chicago. I wanted to know stick/baton stuff. Isn’t it odd that a round stick is chosen to replace a flat bolo or sword? That is like replacing a flat katana with a round broom stick. Isn’t it? katana practitioners would never accept that. So we learned that legions of FMA-ers picked up their rounded sticks, sewed on their Filipino patches in revolution and clickety-clicked onward. As though machetes and thin swords never existed. It really is amazing how many FMA-ers blindly accepted the rattan stick as the real-deal McCoy when you think of it. I mean what would Japanese Katana fanatics think of waves of people using broom sticks and calling themselves Katana experts? Would golfers use hockey sticks? Would Chinese fan fighters use tennis rackets? Would a carpenter use a file instead of a saw? Thus the odd, FMS Stick, schizophrenia I suggested. Everyone seems so happy with their sticks and stick bags. But still, you can hear these darn spoil sports complain that you should not and cannot grab your stick with two hands, nor can you grab your opponent’s stick with your free hand because it’s a sword! You fool! How dare you! It’s a sword! A bolo! A machete! The stick is just like the sword? Is this an excuse? That the universality of FMA weaponry makes them ever so interchangeable? Swords, sticks. Hands. Thin lamps. Rolling pins? “Who throws a shoe, honestly?” I don’t know because while some elements are the same, there are differences bigger than mere nuance. A sword…is kinda’…just like a sword. 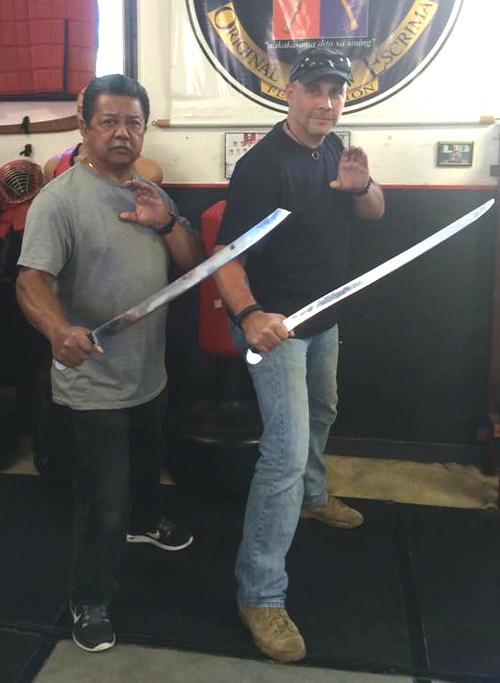 In the last few years I have noticed an increase in…Filipino sword fighting! Yes. Haven’t you seen it? Hundreds of FMA folks have picked up the thin sword. FMA sword grandmasters have arisen from the ashes. I applaud their interest and their understanding that the whole FMA shebang really comes from swords and machetes. My old friends like Chris LaCava and Christof Froehlich, just to name a few, have jumped deep into the roots, understanding the big picture. And listen up you “grab-complainer instructors!” If you are so damned offended by people grabbing sticks and forgetting the stick is a machete? Look what’s in your hand! Look what YOU teach with! PUT DOWN THE DAMN STICK AND PICK UP A TRAINING SWORD INSTEAD! That will straighten things out. You know, you can buy dull, safe training swords and plastic swords and machetes too. You are NOT limited to the round “wooden” stick as an abstract facsimile. If you are going have hissy-fits about it? Then practice what you preach and use a damn sword! Pick a theme! A direction! Seriously! If you think the stick is a sword? Don;t confuse your people. Just use a training sword. If you use a stick? It’s a stick. Grab it. A stick is just a stick. A stick is not a sword. Previous PostShooting an Unarmed Man?Next PostWhere’s Your Gun, Rambo? In the Car?